Properties in Piney Creek average 4.7 out of 5 stars. Property 11: River Country Cabin- Blue Ridge Mountain Views for Miles! Mountain Cabin located in a gated community, within walking distance to river. Property 14: Mountain Cabin located in a gated community, within walking distance to river. Nestled high in the Appalachian Mountains! Property 16: Nestled high in the Appalachian Mountains! Property 17: Secluded and Private Cabin with Amazing Views. Hot tub and WiFi. Property 19: Farm Animals! Quaint Mountain Cabin! 74 Acres of Private Hiking! Trout Fishing, Family Park, Restaurants, Groceries & Shops all in a 5 min. walk! Property 21: Trout Fishing, Family Park, Restaurants, Groceries & Shops all in a 5 min. walk! UNFORGETTABLE - Private Geodesic Dome On 40 Acres With Hot Tub & Pond! Property 24: UNFORGETTABLE - Private Geodesic Dome On 40 Acres With Hot Tub & Pond! THE HIDEAWAY-Romantic Cabin for Two with Privacy Overlooking River W/Hot Tub! Property 32: THE HIDEAWAY-Romantic Cabin for Two with Privacy Overlooking River W/Hot Tub! ABOVE IT ALL-100 mile Panoramic Views, Woodburning F/P, WiFi & Foosball! Property 33: ABOVE IT ALL-100 mile Panoramic Views, Woodburning F/P, WiFi & Foosball! Perfect Little Getaway in the Mountains of Ashe County, NC! Property 34: Perfect Little Getaway in the Mountains of Ashe County, NC! Riverside Escape - Charming Cottage w/Fire Pit, WIFI, Spacious Deck, & More! Property 38: Riverside Escape - Charming Cottage w/Fire Pit, WIFI, Spacious Deck, & More! 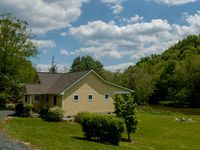 COUNTRY CLASSIC-Farmhouse &180 Acres On River - Book A Summer Vacation Today! Property 43: COUNTRY CLASSIC-Farmhouse &180 Acres On River - Book A Summer Vacation Today! Property 44: On The Creek! Private stocked Trout Stream! Rating Details: The property manager was very helpful. The vacation rental was spotless. I was very happy with the location. I was very satisfied with the condition of the vacation rental. Overall, I recommend this vacation rental. Reviewer Comments: Lovely cabin and great time! A little peace and quiet not too far outside small towns or bigger cities. Lots to do for all sorts - hiking, shopping, eating, museums - when you're not relaxing at the cottage.